2盎司海盗船系列 | 海盗船长超高浮雕银圆 | ?? 2盎司海盗船系列 | 海盗船长超高浮雕银圆 Round three of the incredibly popular Privateer series is here! This round will only be in production for a limited time, This magnificent 2 oz round features a theme not often covered by government mints, private mints - or any mints for that matter. Pirates! This ultra high relief round makes a perfect gift for ship lovers as well as being a great way to introduce people to investing in silver. The obverse of this round features a skull centred over a ship's wheel, with the wheel set over a tattered sail. Entwined with the wheel is a braided line. Encircling the top of the skull is the phrase, "No Prey, No Pay". This was a common pirate law meaning a crew received no wages but, rather, shared whatever loot was taken. 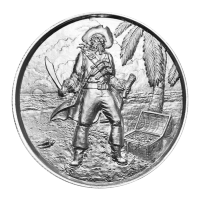 The reverse features a Pirate Captain standing on a beach beside a chest full of his ill-gotten gains. He appears to have found the tree under which he will bury his treasure. He holds in his left hand the map he will draw to be able to return to the spot in the future. The ocean is stormy behind our Captain, and the setting sun lends itself to the dark atmosphere. The Captain appears to be looking directly at us and brandishing his sword, leaving the viewer feeling as though we are about to learn the meaning of "Dead men tell no tales..."! Forget the pieces o' eight and doubloons, modern day buccaneers stack the privateer series as their booty!